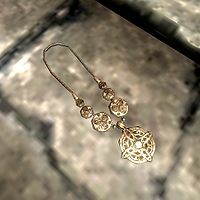 The Amulet of Mara is a necklace which allows you to cast spells from the Restoration school of magic for 10 percent less magicka. Wearing this amulet will also indicate to NPCs that you are available for marriage, as long as you have not already gotten married. It can be purchased for 200 gold from Maramal or acquired during the last stage of The Book of Love quest from Dinya Balu, both at the Temple of Mara in Riften. It may occasionally be available for purchase from various general goods merchants, and will also appear randomly in chests and other loot drops.